China’s June housing transactions rose 31 percent from May as homebuyers defied government curbs and developers posted gains from sales in smaller cities. The value of home sold last month increased to 499.2 billion yuan ($77 billion), compared with 380.9 billion yuan, based on first-half economic data provided by China’s statistics bureau today. Housing sales in the first half climbed 22 percent to 2.1 trillion yuan from a year earlier, according to the data. Chinese developers have posted gains in first-half sales even as the government intensified measures this year to control the risks of asset bubbles. The central bank last week raised interest rates for the fifth time since October, while cities including Beijing and Guangzhou introduced home-purchase restrictions earlier. More developers are selling homes in so-called third and fourth-tier or less affluent cities which haven’t introduced local restrictions or are immune to nationwide measures targeting speculators, who usually buy in bigger metropolitan areas, according to Hu. China Vanke Co., the country’s biggest developer, reported last week that sales in the first six months rose 79 percent to 65.7 billion yuan, while Evergrande Real Estate Group said on July 11 that sales more than doubled to 42.3 billion yuan. The measure tracking property stocks on the Shanghai Composite Index rose 0.6 percent at the 11:30 a.m. midday break, extending this year’s gain to 8.1 percent. Investment in Chinese real estate rose 33 percent to 2.6 trillion yuan in the first six months from a year earlier, according to the government data today. 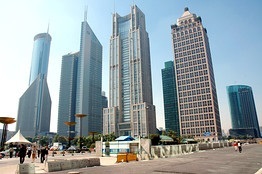 New property construction in the first half climbed 24 percent to 994.4 million square meters. China’s economy rose 9.5 percent from a year earlier in the second quarter, down from 9.7 percent in the first. China’s target to build 10 million social housing units or affordable homes this year helped boost real estate investments, according to CIMB-GK Securities Research Pte. The government ordered all social housing projects to start before the end of October. “With the deadline approaching, I’m not worried about this year’s real estate investment data,” Hu said. May new home prices increased in all but three of the 70 Chinese cities monitored by the government. The national statistics bureau is scheduled to report June’s home price data on July 18. China’s June home prices eased in eight of the country’s 10 biggest cities, while nationwide prices rose 0.4 percent in June from May, SouFun Holdings Ltd. (SFUN), the country’s biggest real estate website, said on July 1.